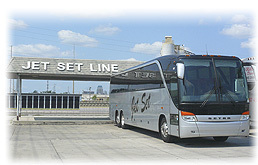 Jet Set Express offers affordable price with and quality bus services in Florida. Popular routes between Orlando, Miami, Kissimmee, and Miami Beach. Find Jet Set Express bus schedules, prices, dates, and view bus reviews while you can easily book your tickets online. The costumer service for the woman’s checkin is deficiente. The bus Driver was punctual and courteous he made announcements to keep us updated on next stops and baggage instructions.